Below you fill find all funeral homes and cemeteries in or near Anchorage. Suburbs of Anchorage: Anch, Ft Richardson. Anchorage is also known as: Anchorage Municipality, Municipality of Anchorage, and Anchorage Municipality / Anchorage municipality. Their current mayor is Mayor Ethan Berkowitz. With a featured listing, your funeral home will hold the most prominent position on our network, along with a custom detail page highlighting your property. Please contact us for details. Zip codes in the city: , 99529, 99530, 99540, 99599, 99695. Anchorage County funeral flowers can be purchased from one of the local funeral shops we partner with. There are currently 14 funeral options for this city. Anchorage has been featured in films like: Into the Wild (2007), Star Trek VI: The Undiscovered Country (1991), and God Speed You! Black Emperor (1976). Some of the notable people born here have been: Libby Roderick (songwriter and singer), Jeff Fry (software tester), Khleo (actor and rapper), Chris Kuper (american football player), Mark Schlereth (american football player and television show host), Valerie Plame (writer and staff), and Annie Parisse (actor). Anchorage (officially called the Municipality of Anchorage) is a unified home rule municipality in the U.S. State of Alaska. With an estimated 300,950 residents in 2013, it is Alaska's most populous city and contains more than 40 percent of the state's total population; among the 50 states, only New York has a higher percentage of residents who live in its most populous city. All together, the Anchorage metropolitan area, which combines Anchorage with the neighboring Matanuska-Susitna Borough, had a population of 396,142 in 2013.Anchorage is located in the South-central portion of Alaska at the terminus of the Cook Inlet on a peninsula formed by the Knik Arm to the north and the Turnagain Arm to the south. The city limits span 1,961.1 square miles which encompass the urban core, a joint Military base, several outlying communities and almost all of Chugach State Park.Anchorage’s location on the globe puts it within 9 and ½ hours by air to nearly 90% of the industrialized world. For this reason Anchorage is a common refueling stop for many international passenger flights and is home to a major FedEx Hub which the company calls a “critical part”” of its global network of services.Anchorage has been named an All-America City four times, in 1956, 1965, 1984–85, and 2002, by the National Civic League. It has also been named by Kiplinger as the most tax-friendly city in the United States. It was written on March 31st, 2019 that David C Oliver passed away in Anchorage, Alaska. Oliver was 90 years old and was born in Fall Creek, OR. Send flowers to express your sorrow and honor David C's life. It was disclosed by Register Guard on January 13th, 2019 that George Preston Livesley died in Eugene, Oregon. Livesley was 76 years old and was born in Anchorage, AK. Send flowers to express your sorrow and honor George Preston's life. It was reported on December 8th, 2018 that Frank Darnell passed away in Anchorage, Alaska. Darnell was 93 years old and was born in Cripple Creek, CO. Send flowers to express your sympathy and honor Frank's life. It was noted on December 4th, 2018 that Norman Arthur Didricksen passed on in Anchorage, Alaska. Didricksen was 63 years old. Send flowers to share your condolences and honor Norman Arthur's life. It was reported by The Lufkin Daily News on November 21st, 2018 that Cameron Hayes Sanders perished in Lufkin, Texas. Sanders was 1 years old and was born in Anchorage, AK. Send flowers to express your sorrow and honor Cameron Hayes's life. It was written on October 30th, 2018 that Bruce Lee Orton perished in Anchorage, Alaska. Orton was 68 years old and was born in Los Angeles, CA. Send flowers to express your sorrow and honor Bruce Lee's life. It was disclosed on October 24th, 2018 that Penny Lee Dufek (Graves) passed on in Post Falls, Idaho. Ms. Dufek was 59 years old and was born in Anchorage, AK. Send flowers to share your condolences and honor Penny Lee's life. It was disclosed on September 30th, 2018 that Marvin Eugene Bailey passed on in Anchorage, Alaska. Bailey was 82 years old and was born in Memphis, TN. Send flowers to express your sympathy and honor Marvin Eugene's life. It was revealed by Chicago Tribune on September 23rd, 2018 that William Gregory "Bill" Wyllie died in Orland Park, Illinois. Wyllie was 61 years old and was born in Anchorage, AK. Send flowers to share your condolences and honor William Gregory "Bill"'s life. It was written by Skagit Valley Herald on September 21st, 2018 that Scott Fredrick "Scooter" Fincke passed on in Seattle, Washington. Fincke was 81 years old and was born in Anchorage, AK. Send flowers to express your sorrow and honor Scott Fredrick "Scooter"'s life. Living in a city which constitutes a large portion of the state's populous; it can be daunting to locate the funeral services that suit your needs. Our goal is to make this task easier. Located below you can find listings for Anchorage area funeral homes, cemeteries, as well as other local funeral services. 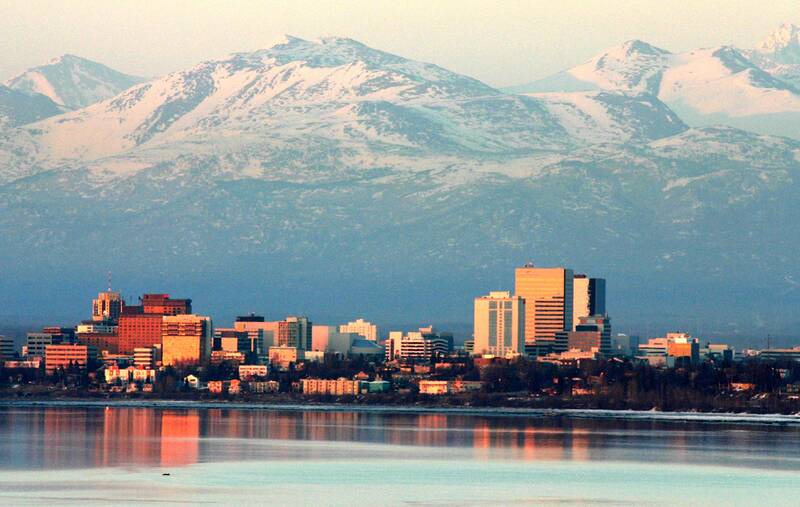 Anchorage is largest city in Alaska, making up 40% of the state's population. Unlike many other cities in Alaska, Anchorage was not founded as a site for fishing or mining. It arose as a construction site for the Alaska Railroad. Located in a subarctic climate Moose, Bears, Mountain Goats, Dall sheep, Wolves, and foxes make up the rich wildlife surrounding the area, with it numerous parks. The official website for the city of Anchorage is http://www.muni.org/pages/default.aspx. We work with local florists and flower shops to offer same day delivery. You will find budget sympathy flowers in Anchorage here. Our funeral flowers are cheap in price but not in value.